The Canadian Orca is the 10th design released in the Royal Canadian Mint’s commemorative O Canada Series. Silver.com is delighted to be able to offer these charming limited edition coins in one-half troy ounce fine silver. 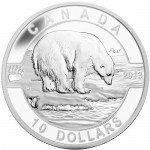 The freshly minted Orca coins are a choice addition for collectors who appreciate sea life or Canadian wildlife. Only 40,000 of these coins have been minted! Contains 1/2 oz .9999 pure silver. Carries a $10 CAD face value backed by the Canadian government. The Royal Canadian Mint expresses particular affection for the orca whale, which is honored its highly social culture with familial bonds, community structure, complex societies, and more. Many collectors of precious metals have a special affection for the RCM and their celebratory approach towards metal-working. RCM’s unique collections and special edition coin consistently inspire a sense of awe with their innovative and finely skilled craftsmanship and minting techniques. 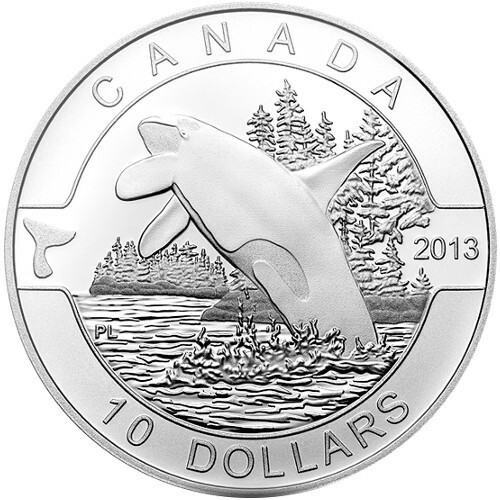 The Orca commemorative coin was designed by Canadian artist Pierre Leduc. It portrays a side view of a powerful breaching orca. The massive creature is almost entirely outside of the water, which rises in torrents around the orca’s exquisitely rendered body. The background displays Northwest Pacific coast with its tall, majestic trees and rocky shoreline. This dynamic image is encircled with the engraved word CANADA and the face value of 10 DOLLARS. The image is flanked with the mint date and a stylized orca tail fin. 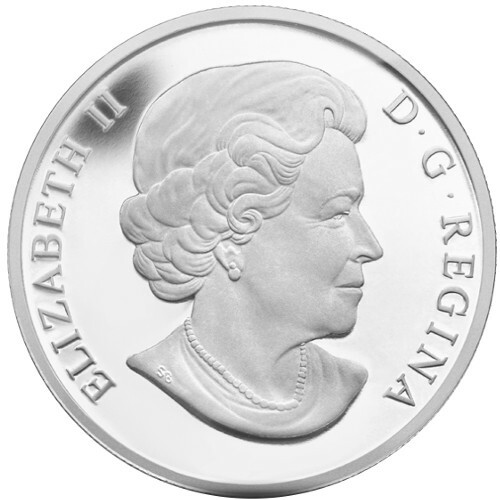 Silver.com is pleased to offer a variety the RCM products, including commemorative and special edition coins and bullion bars in both gold and silver and in varying sizes. Freshly minted Orca coins will be sent in their original maroon clamshell case that is lined with flock and protected by a black beauty box provided by the RCM. Orders are sent through USPS or UPS within three days of completed payment. Your order will be delivered to the destination of your choice fully insured while on its way to you. All orders over $300 require a signature upon delivery for further security. 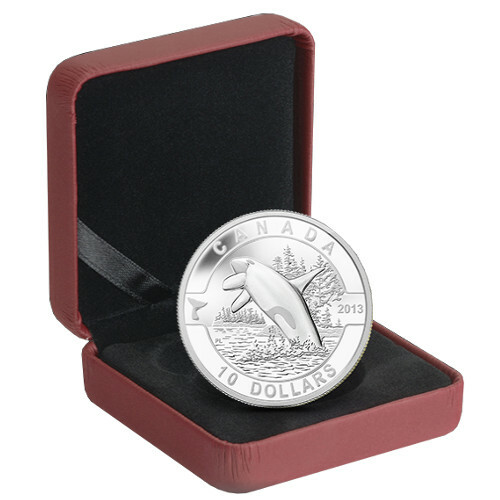 If you have any questions about the commemorative Orca coins produced by the Royal Canadian Mint, the ordering process or anything else Silver.com can be reached at 888-989-7223. Our professional staff is also available through live chat or email as well.